Toon resultaten voor tags 'avp'. Vandaag een mailtje van Prodos Games, de maker van AvP: The Hunt Begins. AvP is discontinued... of wel einde verhaal... komt omdat de licentie met 21st Century Fox niet verlengd gaat worden. Laat nu net Disney Fox hebben gekocht... jammer weer... Maar goed Prodos eindigt het wel een knalletje... 2 nieuwe units die te bestellen zijn (en tevens de laatste). Deze daarnet maar snel besteld. En ook gelijk het Unleashed boek erbij besteld dat ik het ook als miniature game zou kunnen spelen. Dat wil ik wel proberen aangezien ik bezig ben met het schilderen van AvP. Er zit wel een voordeel aan deze mededeling, het einde is in zicht voor het schilderen van AvP! Nu hopen dat ik het spel vaker op tafel krijg, misschien dat het helpt nu het niet meer te verkrijgen gaat zijn. Alien vs Predator: Hot Landing Zone (AvP:HLZ) is an expansion to Alien vs Predator: The Hunt Begins (AvP:THB) tactical board game. In this expansion, rules for new Models are being introduced for each Faction! The AvP:HLZ expansion allows for the different Forces to do battle on limited visibility on the planet’s dense surface Jungles. Each Model presents new tactical opportunities or a more advanced foe your Force needs to overcome, and they can be added to your existing AvP:THB Force or your used according to the Advanced Rules’ Custom Forces. The Transport and Harass mechanic is introduced, in the form of a Dropship’s pilots taking part in the struggle for survival. The Human faction uses the Dropship to rapidly relocate their forces, while the Alien and Predator Factions try to make it too Hot a Landing Zone and cancel the Airlift operations. 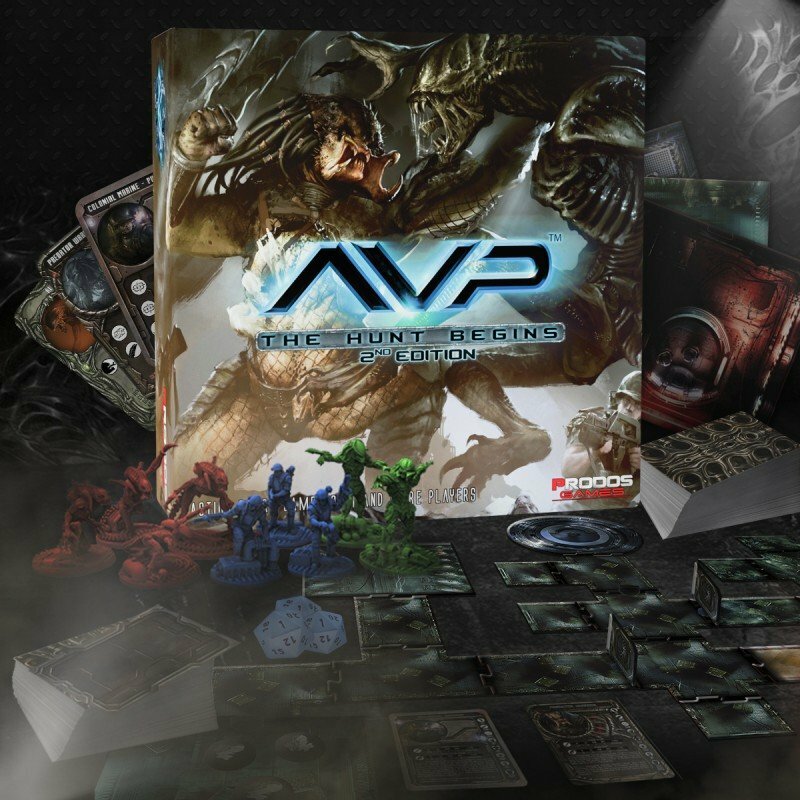 AvP:HLZ presents additional rules, where you get to play a Free for All scenario of up to six players. Additional gaming boxes will be needed for this purpose, and use of add-on packs and Advanced Game Rules is highly recommended. 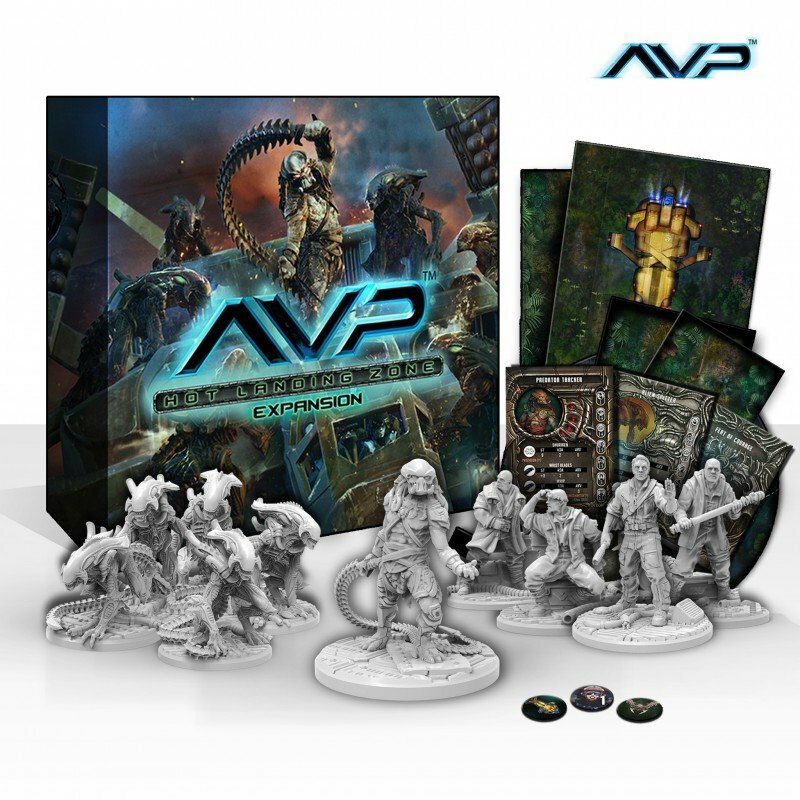 Whether you play using the Basic Rules or the Advanced Rules of the AvP:THB rulebook, this expansion allows you to expand your board game with the inclusion of Jungle Tile rules and other components, allowing for new and exciting Squads to join the fray. The use of Advanced Rules is enhanced as well, through additions to all Strategy and Event Cards, to either be added into the respective Decks, or replace cards from the basic set. Alien vs Predator: The Hunt Begins is a dynamic, tactical board game for one or more players that allows you to take control of one of three Forces: Alien Xenomorphs, Predator or Human Colonial Marines and face off against each other on a derelict spacecraft called the USCSS Theseus. From Alien Xenomorphs skulking in the shadows, waiting for the moment of weakness to pounce on and capture new hosts for the brood, to the well-trained Colonial Marines who are geared up with state-of-the-art equipment and finally to a mysterious race of brutal extra-terrestrial Hunters that the humans call Predators, each Force offers a unique set of skills to provide their own diversity to the gameplay. There’s no shortage of terror and excitement in Alien vs Predator! Alien vs Predator offers many challenging game types, which can be played by one or more players and a main campaign consisting of 10 Missions joined together into a narrative story depicting dramatic events taking place on board the USCSS Theseus, this game provides hours of suspense and action! Alien vs Predator can also offer two sets of rules (Basic and Advanced) which offer beginners a chance to jump into the action easily but allows for depth and growth for experienced gamers alike! The game is a "sandbox" game so fully moddable and with future addons will open the game world up even further !